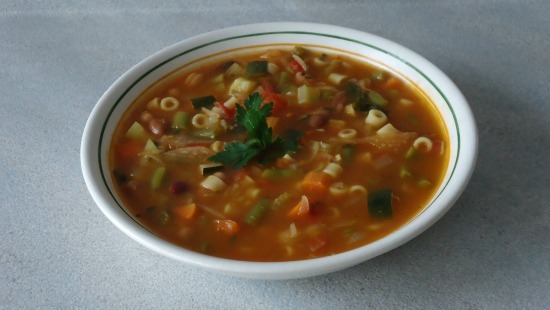 Love this diet minestrone soup because it focuses on keeping the calories low and the nutrition level high. This easy to follow recipe pleases all ages at the dinner table. Besides being an excellent diet soup it is very filling and offers a good source of fiber while being extremely cost efficient. In a soup pot add the oil, onions, garlic, celery and carrots. Also add a little salt and pepper at this time as the salt makes the veggies sweat a little which helps release their flavors better. Turn stove to medium high and sauté ingredients for about 5 – 7 minutes. Add the tomato paste and mix with veggies and sauté for an additional 1 – 2 minutes. Add the tomatoes and the oregano and continue sautéing for another 2 minutes until some of the tomato's juices are released by the heat. Now add in all the liquid, cabbage, green beans, zucchini, spinach and pasta and bring to a boil. Reduce heat and simmer for about 20 minutes or until veggies are tender. Now add the canned beans and simmer an additional 5 – 7 minutes. Since the beans are already cooked they only need to be cooked with the other ingredients for a short time. Add the parsley, mix once and remove from heat. If made into 5 servings, this soup has about 154 calories per serving. This soup is very filling and very hearty. It has a little more calories than some of our other diet soups, but it also keeps you fuller, longer. Don’t have any chicken broth handy? No worries, just replace it with the same amount of water and 2 chicken bouillon cubes. If you don’t have fresh tomatoes just used canned, though I must admit that fresh tomatoes gives this soup a special summer time zesty taste that helps bring smiles to the dinner table. For those cooks who don’t measure, if you put too much pasta in this soup it can soak up lots of the soup’s liquid by the next day making it more of a stew than a soup. You can do one of two things to avoid this problem. 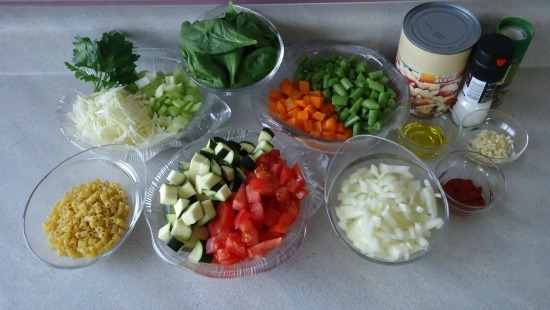 Add more liquid to the soup the next day or cook the pasta separately from the diet soup.